Yesterday was Valentine's Day, and both Keith and I are extremely broke, and anyway Ned is staying with us at the moment, so we couldn't really go out for poshy food or even successfully cook (what with big doggy snout getting into everything and wondering what treats you have in store for him (and that's just Keith! See what I did there? Do you?)) so Keith kindly offered to take the day off work and hang out here with me. Our first romantic film was Keith's choice. Resident Evil 2: Apocalypse is, on the surface, not the kind of film you would let me watch, being as it is, full of zombies. You all know the story, or similar stories at least. Big corporation trying to breed superhuman mutated futuristic soldiers, accidentally releases virus into the water table (or something), hey presto, zombie attack. 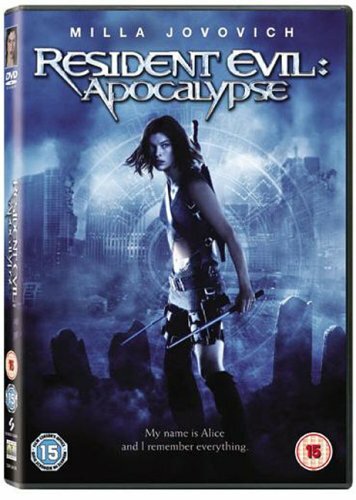 Only in Apocalypse the emphasis is more on the superhuman soldiers that the evil corporation did manage to create, namely Mila Jovovich and her (now ex-, given his zombie status) boyfriend. The dialogue is piss-poor, the story is refreshingly close to a computer game, but it's a very nicely shot film and manages to remain cheesily exciting throughout. And it's only about an hour and a half long. Much better than that tedious computer-generated thing that was out a few years ago, and all the live actors are so pretty and plastic that they kind of look computer-generated anyway, so everyone's a winner. Not as good as the first which is more claustrophobic but definitely good crack. Am I the only person who thought that the Final Fantasy film wasn't utter crap? I think Andrew liked it as well, but he might have been too scared to say so because I was sitting beside him, hating every minute of it. I tried to appreciate it on several levels throughout the film, but in fact it was and is pants. RE2 is great fun. Proposition: there is absolutely no way back to the great seventies paranoid thrillers, because it's the default these days that all companies, governments etc are crooked.